A Self-Defence Force helicopter crash-landed on a residential area. A house has caught fire, told a local government official. Tokyo, Japan: A Japanese military helicopter crashed Monday in a residential area in the southwest of the country, setting at least one home on fire, local officials said. "A Self-Defence Force helicopter crash-landed on a residential area. 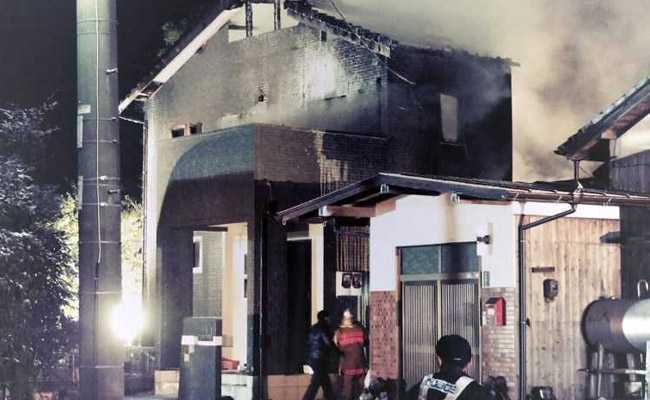 A house has caught fire," local government official Katsuhide Tanaka told AFP. There was no immediate confirmation of any casualties in the crash in the town of Kanzaki. Japan's NHK television showed a thick plume of grey smoke rising from the site of the crash in between the rooftops of local houses. Local firefighters could be seen running through the streets with red firehoses as people were evacuated from the area. Defence Minister Itsunori Onodera confirmed a helicopter had gone down in Japan's Saga region. "The helicopter crashed and burst into flames," he told reporters. "Images show that the helicopter appears to have crashed in a residential area and we are checking that." "We're still confirming the scale of casualties," he added. A defence ministry spokesman told AFP there were two people on board the Apache helicopter when it crashed. The local fire authority said it had dispatched 14 fire engines and three ambulances to the site. The crash raised memories of a 2016 incident in which a Japanese air force jet with six people aboard went missing in mountainous terrain. Four bodies were later recovered. Japan's Self-Defence Forces (SDF) have been banned from waging any kind of combat beyond defence of the nation since the US-imposed constitution of 1947 that followed the carnage of World War II. They have been deployed overseas in peacekeeping missions, some of which have proved controversial at home. And while the SDF is strictly limited in terms of the scope of its military activity, Japan nonetheless boasts an impressive array of weaponry with highly trained personnel.